Processed and powdered nibs from the cocoa plant; this is the primary ingredient of chocolate. 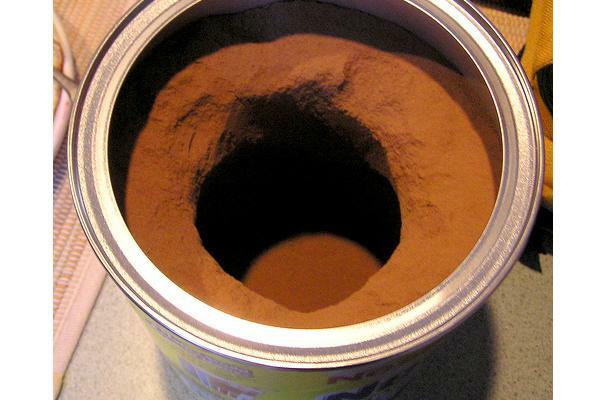 There are two different types of cocoa powder: Dutch-processed and natural. Dutch-processed cocoa powder has been treated with alkali to lower its acidity and bring out a more intense flavor than natural cocoa powder. Dutch-processed cocoa powder will not react with baking soda the way natural cocoa powder will, so it must be used along with powder; the combination of basic baking soda and acidic natural cocoa powder will cause the recipe to rise. A fine powder that ranges in color anywhere from a tan to a dark chocolate brown. It comes in sweetened, and unsweetened varieties as well as milk, semi-sweet, bitter, and various percentages of true cocoa. Choosing: The powder must be extra fine, when rubbed between your fingers it must stick and even smear. It must smell like unsweetened chocolate. Be careful to look for bugs or casings in teh container. Buying: Cocoa of all varieties are available year round in your local grocer in the baking goods aisle.